Vehicle owners value personalised services that are designed for their convenience and that enhance their experience, according to the inaugural J.D. Power 2018 U.A.E. Customer Service Index (CSI) Study, SM released today. 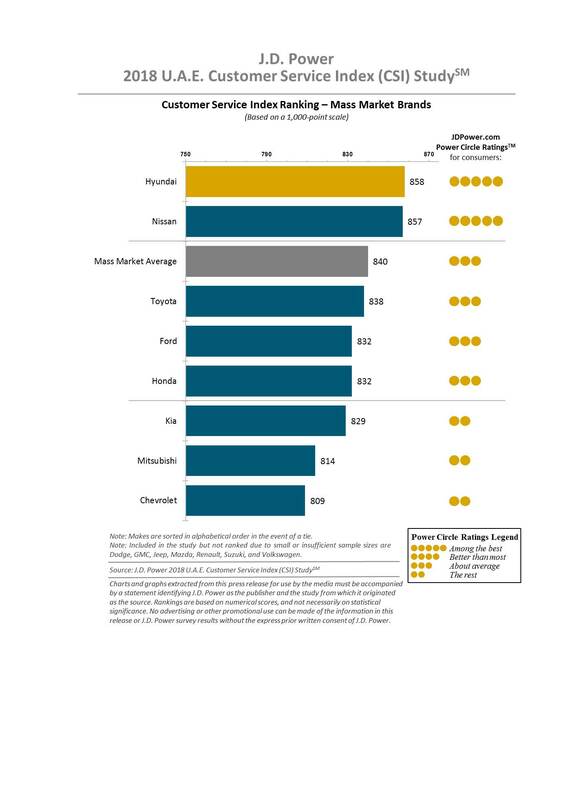 Ensuring that service advisors are front and center when it comes to communicating with vehicle owners helps drive overall satisfaction with their servicing experience, which increases by 35 points (on a 1,000-point scale) when an advisor is available to speak to the customer when they drop off their vehicle. Despite this finding, 35% of customers indicate that they spoke to a receptionist rather than a service advisor to discuss their servicing needs when visiting their dealer. Satisfaction amongst these customers is 50 points below the industry average. Furthermore, satisfaction increases by 8 points when service advisors deliver the customer’s vehicle back to them (72%) as opposed to another member of the staff after completion of the service or repair work (29%). Transport vehicle for drop-off: Nearly one-half (45%) of customers indicate that they needed transport for a drop-off when their vehicle was being serviced. However, 62% of vehicle owners at the service center did not receive transport, which lowers satisfaction by 17 points. Personalised service experience: Overall satisfaction is 25 points above average amongst the 40% of customers who were offered valet parking. Similarly, amongst the 70% of customers who serviced their vehicle using quick/ express service, satisfaction is 38 points higher than average. Additionally, satisfaction is 13 points higher amongst the 44% of customers who were told the name of their service mechanic than amongst those who were not given the name—underscoring the importance of service mechanics in the vehicle servicing experience. Need to review and redefine the service appointment process: The time taken to hand over the vehicle for service is critical for customers in the U.A.E. Surprisingly, a greater proportion of customers who made an appointment for vehicle service say they had to wait to meet their service advisor, compared with those who dropped by for servicing (29% vs. 19%, respectively). Furthermore, the amount of time taken to hand over the vehicle for service is also higher amongst customers who had a scheduled appointment, with 34% these customers having had to wait more than 15 minutes, compared with only 22% of those who dropped by. Award recipient segments include mass market brands and luxury brands. Of the five award-eligible luxury brands, INFINITI ranks highest in satisfaction with dealer service with a score of 897, followed by Mercedes-Benz with a score of 862 and Lexus with a score of 858. 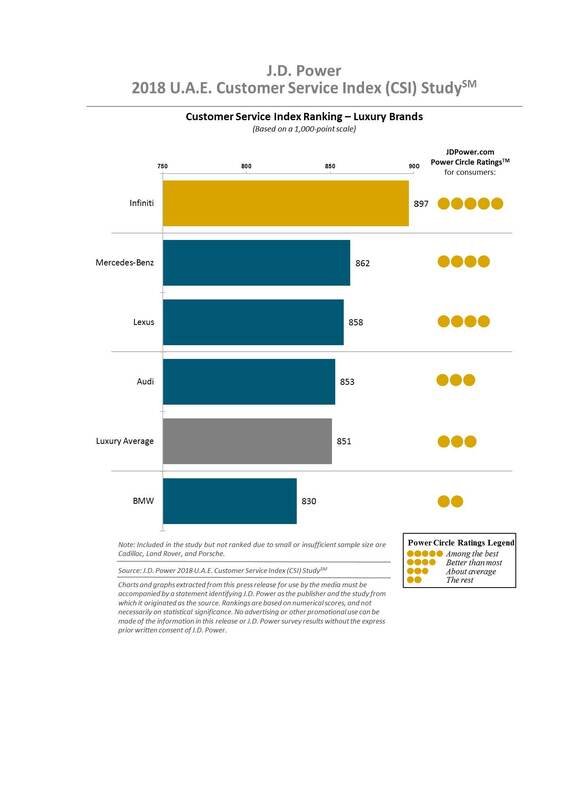 Of the eight award-eligible mass market brands, Hyundai ranks highest in satisfaction with dealer service with a score of 858.Nissan (857) ranks second, followed by Toyota (838) and Ford and Honda in a tie (832 each). The 2018 U.A.E. Customer Service Index (CSI) Study is based on responses from 2,806 owners who purchased their new vehicle between September 2015 and February 2017 and took their vehicle to an authorized dealership service center between March 2017 and February 2018. The study was fielded from September 2017 to February 2018 in all emirates across the U.A.E. The study measures customer satisfaction with service at an authorized service center for maintenance or repair work amongst owners of 12- to 24-month-old vehicles who visited the service center in the past six months. The study measures overall satisfaction by examining five factors (listed in order of importance): service advisor (24%); service initiation (22%); vehicle pick-up (19%); service quality (19%); and service facility (17%). J.D. Power has offices in Singapore, Bangkok, Beijing, Shanghai and Tokyo that conduct customer satisfaction research and provide consulting services in the automotive, information technology and finance industries in the Asia Pacific region. Together, the five offices bring the language of customer satisfaction to consumers and businesses in Australia, China, India, Indonesia, Japan, Malaysia, Philippines, Taiwan, Thailand and Vietnam. In the United Arab Emirates, J.D. Power is collaborating with Skelmore Consulting Group, a Dubai-based management consulting firm, to launch two syndicated satisfaction studies with customized automotive solutions for companies. J.D. Power is a portfolio company of XIO Group, a global alternative investments and private equity firm headquartered in London, and is led by its four founders: Athene Li, Joseph Pacini, Murphy Qiao and Carsten Geyer. Information regarding J.D. Power and its products can be accessed through the internet at asean-oceania.jdpower.com. RACISM AND DISCRIMINATION. THE HALLMARK OF “CUSTOMER SERVICE” AT CAIRO AIRPORT.